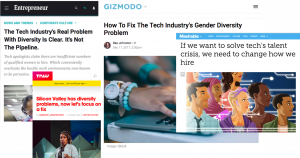 Diversity has become a major issue across society. 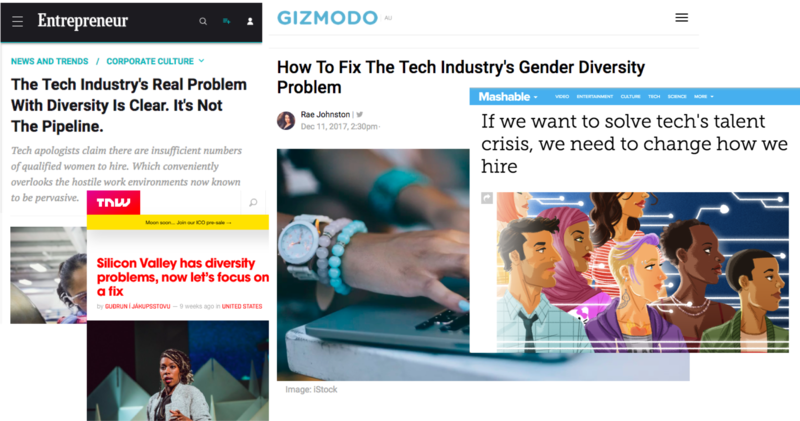 We would like W3C to be a model of supporting diversity. As an international organization we can see the immense value we gain from having expertise from across multiple countries and cultures. Soon 50% of the world will be on the Web. We know we will need to reflect the diversity of the whole of our world as more and more people begin to access, use and continue to create the Web in all its full potential. During the Spring W3C Advisory Committee Meeting, a panel on diversity focused on progress we have made and how much more is required. I shared graphs on diversity, and the W3C Advisory Committee introduced a Diversity Scholarship. Different participants are involved in different ways; with mailing lists and GitHub postings distributed across many locations. 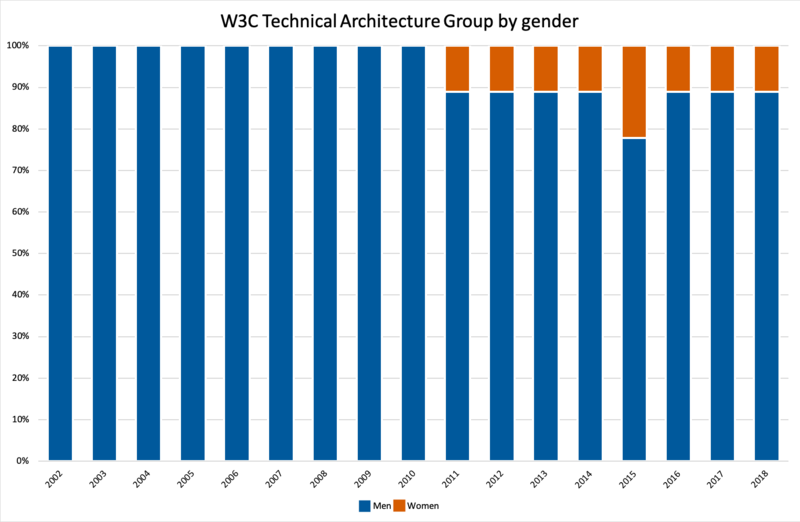 As we don’t collect participants’ personal and demographic data to preserve privacy, it was difficult to gather data for different characterizations of diversity, but we were able to focus on gender and geography for several representative bodies (Advisory Board, Technical Architecture Group, W3C Management (W3M)). 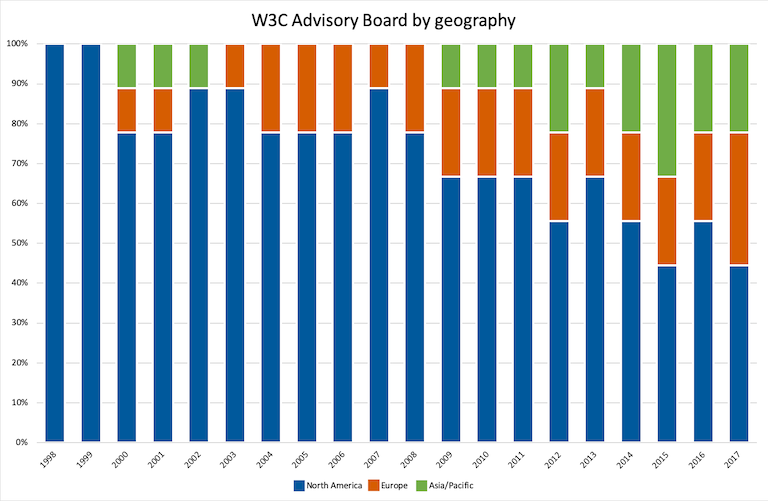 The W3C Advisory Board provides ongoing guidance to the Team on issues of strategy, management, legal matters, process, and conflict resolution. The elected Members of the Advisory Board participate as individual contributors not as representatives of their organizations. Advisory Board positions are member-nominated. The gender diversity of the AB over the last 20 years has never been great, although the diagram shows that this has been improving recently. We are working on outreach to encourage more women and underrepresented groups to run. Looking at the Advisory Board by geography, all 9 members during the first two years were from Northern America. Starting in the year 2009 and in subsequent years, we’ve improved the geographical diversity and it’s kept improving over these last few years. The W3C Technical Architecture Group (TAG) is a special working group within the W3C, chartered with stewardship of the Web architecture, to document and build consensus around principles of Web architecture, to resolve issues involving general Web architecture brought to the TAG, and to help coordinate cross-technology architecture developments inside and outside W3C. TAG positions are member-nominated or appointed by the W3C Director. Gender diversity only improved from 0 to 1 or 2 women on the TAG, and only starting in 2011, in the the 10th year of that group. We need to make more progress here. 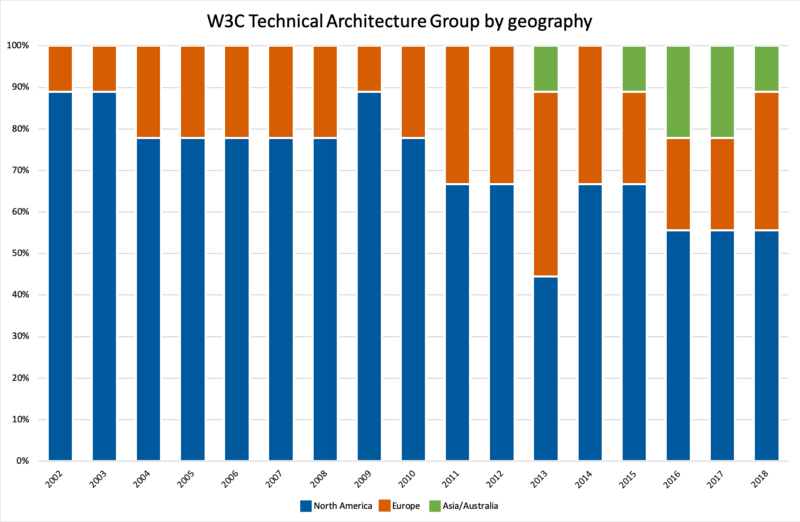 Looking at the TAG by geography, although the Northern American contingent is still pretty strong, improvement in diversity has been happening starting 2013, coinciding with what some in our community have referred to as the TAG reform: outreach from the TAG co-chair and members in search for the right people involved in building the Web in smarter ways. The W3C management team is responsible for the day to day coordination decisions for the team, resource allocation, and strategic planning. 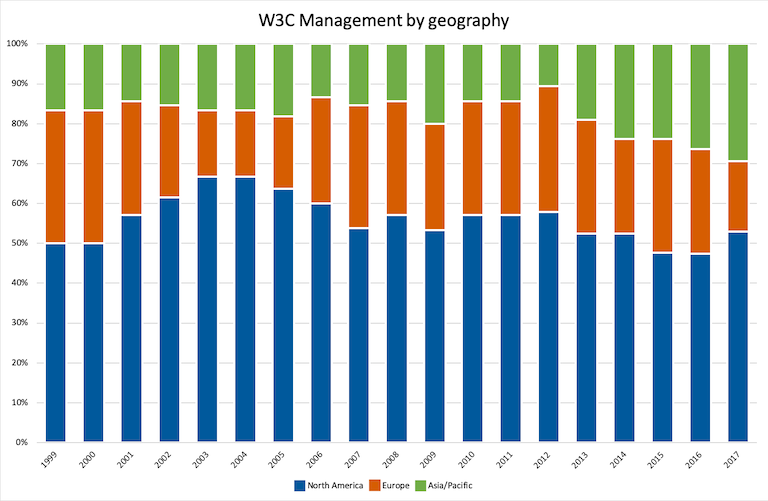 The diagram uses percentages because the number of persons on W3M has changed over the years. 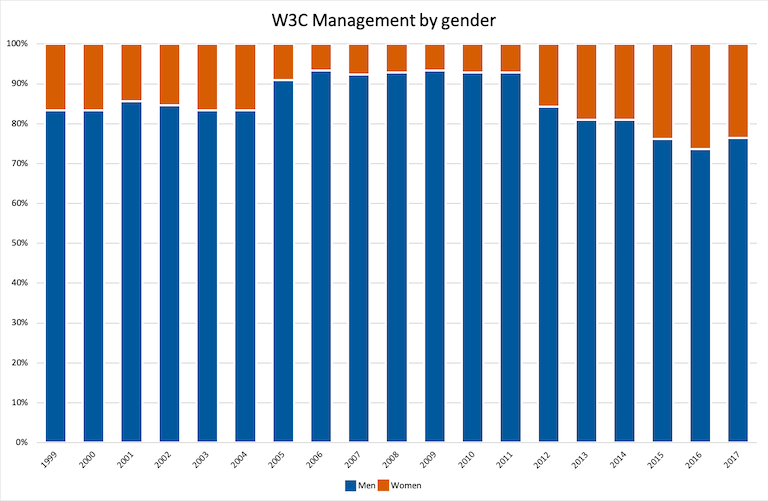 There was a period when there was one woman at W3M. It has improved to some extent. Looking at W3M by geography is relatively good, still a little tilted towards Northern America, but not as much as before. 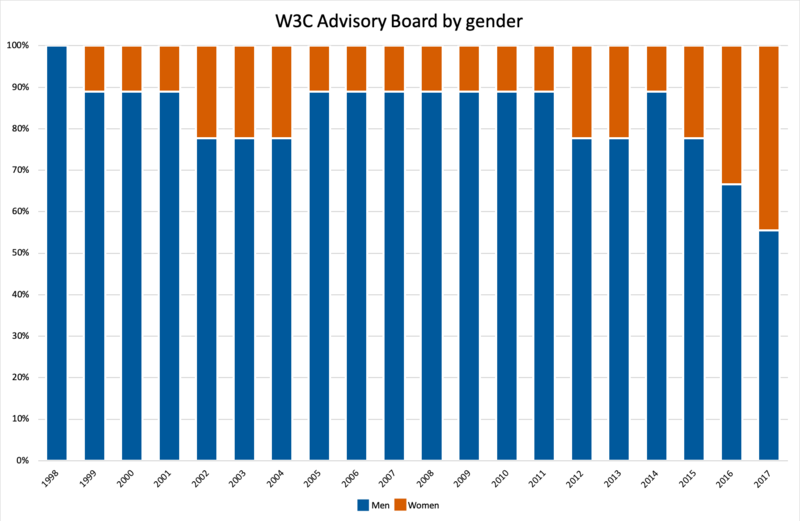 encouraging Advisory Committee representatives to nominate a more diverse set of people to run for Advisory Board and Technical Architecture Group Elections. A W3C Member, Samsung Electronics, proposed and agreed to start funding “Diversity Scholarship” for TPAC attendance, and W3C Members The Paciello Group, Consensus System and Microsoft stepped up to sponsor diversity scholarships. The Diversity Scholarship includes plane and hotel as eligible expenses. Applicants must be from a traditionally underrepresented and/or marginalized group in the Web community, including but not limited to: persons identifying as LGBTQ, women, persons of color, and/or persons with disabilities; and be unable to attend without some financial assistance. Applications are due by 15 July, by supplying nominal information to the Team (e.g. under-represented community, which role in what group at TPAC, estimated costs to travel and participate at TPAC, why a subsidy is needed). We hope to be able to support multiple applicants with scholarships. Therefore, please indicate whether you may be able to potentially share costs on some of the costs that you have mentioned. W3C Management will decide by 25 July how to allocate the available money based on available funding, number of applicants and information supplied. Applicants will be notified personally and recipients will be able to register in time for TPAC.